Uh-oh. It’s that time of year when white people “debate” whether or not blackface Halloween costumes are racist or at all acceptable. In today’s edition, Megyn Kelly is wondering aloud, “But, what is racist?” about a white person darkening their skin and dressing up as a black person on a costume holiday. “You do get in trouble if you are a white person who puts on blackface for Halloween,” said Kelly, “or if you’re a black person who puts on whiteface for Halloween. Back when I was a kid that was okay as long as you were dressing up as, like, a character.” It’s a good thing staking your argument about blackface on the “when I was a kid” line of logic isn’t dated or dangerous, otherwise that would be a really silly way to defend your racist Halloween costume ideas. See the full exchange and Kelly’s support of Luann de Lesseps’s Diana Ross costume below. Update: According to The Hollywood Reporter, Kelly is privately apologizing to co-workers following blackface-related on comments on this morning’s Megyn Kelly Today. “In an internal email, Kelly wrote that she’s heard from colleagues and friends and realizes her comments were wrong,” reports THR. The email itself has not been made public. Update 10/24, 1 p.m.: Kelly’s apology email to her colleagues has been made partially public by NBC, and it was shared on Today this morning. “I realize now that such behavior is indeed wrong, and I am sorry,” Kelly wrote, adding that she’s never been a “pc person” but she understands why it’s important to be more “sensitive” now. She the full Today clip below, which does not feature Kelly herself, just previously aired footage of her. 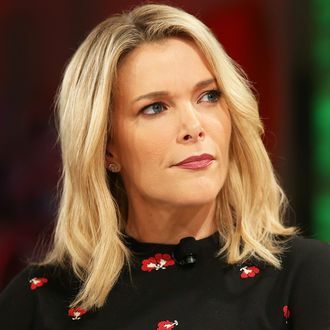 Update 10/24, 5:30 p.m.: Kelly also gave a public apology on today’s broadcast of Megyn Kelly Today. And she followed that with a segment about why blackface is racist and always bad.